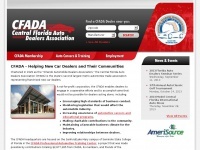 The CFADA plays a large role in the automotive industry from contributions, education and scholarships to events and jobs at new car dealers. 2. See All Dea­lers /central-flori­da-auto-dea­lers-as­socia­tion/di­rectory/new-car-deale..
5. Auto Ca­reers & Trai­ning /central-flori­da-auto-dea­lers-as­socia­tion/automoti­ve-ca­reers-and-..
8. Digital Dea­ler 25 /central-flori­da-auto-dea­lers-as­socia­tion/auto-in­dustry-news-and-.. The web server used by Cfada.org is located in Charlotte, USA and is run by ORCS Web. This web server runs 9 other websites, their language is mostly english. The Cfada.org websites were developed using the programming language ASP.NET and served by a Microsoft-IIS server. XHTML 1.0 Transitional is used as markup language on the webpages. To analyze the visitors, the websites uses the analysis software Google Analytics. The website does not specify details about the inclusion of its content in search engines. For this reason the content will be included by search engines.